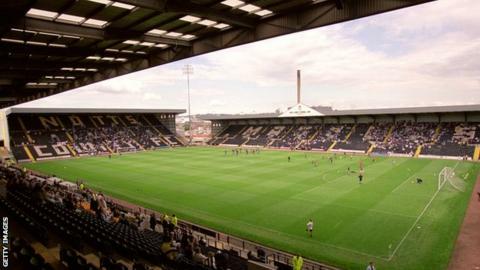 Notts County will appear in the High Court on Monday after being issued with a winding-up petition by HM Revenue & Customs. HMRC brought the petition over monies due on December 19, 2012, but County say their finances are up to date. The club said they only found out about the case on Friday but expect it to be thrown out. "This action is regarded by the board as both disruptive and damaging," said a statement on the club's website. The case will not be heard before 11:00 GMT. County, who are currently 11th in League One, have instructed legal counsel to represent them, but insist they will move to recover their costs in addition to claiming damages "for the harm suffered by the football club". "The club can state, unequivocally, that the business is completely up to date with all VAT and PAYE monies," the statement added. "Unfortunately, we had no option other than to instruct legal counsel to represent us, but we fully expect this issue to be resolved in our favour once the judge has before him all the facts." Current County chairman Ray Trew, who bought the club for £1 in February 2010, saved the club from administration the same year despite debts of around £6m. In January, Trew said he had invested £12m into the Meadow Lane club but would not spend any more money because of falling attendances and a lack of support. HMRC said it could not comment on the affairs of individual businesses.